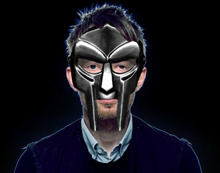 Radiohead frontman Thom Yorke has remixed 'Gazillion Ear' by Doom (ne MF Doom). The Oxford rocker has long been a fan of the Metal Faced one and has now added a pristine sheen of glacial gloom to the Doom. 'Gazillion Ear' - originally produced by J Dilla - is taken from the forthcoming Doom, Born Like This, released 23rd March on Lex Records.